Jeff Damour, Engineering Manager of Converter Accessory Corporation (CAC) presented his acclaimed presentation “Web Spreading” during a free webinar on November 18 at 11:00 AM EST. This Web Spreading webinar covered the fundamentals of why web wrinkles occur and how several types of spreader rolls operate to remove wrinkles. Advantages and disadvantages of each of these spreading devices were discussed. The presentation is generic in nature and is meant as a tutorial to allow converters to understand the best methods for combating their wrinkle problems. “This hour long webinar offers converters a wonderful opportunity to learn causes and cures of web wrinkle problems, with the convenience of never having to leave their desk.” Damour said. This online event was extremely well attended and included companies like Millipore, Kimberly Clark and Saint-Gobain. Some comments from attendees include “very informative”, “great visuals” and “appreciated your explanations of the theory”. Webinars include question and answer periods, live polling questions and live drawings and sketches to allow attendees to best understand web spreading methods and how web spreaders can work for their specific problems. With more than 30 years experience providing converters with innovative solutions engineered to improve efficiency, Converter Accessory Corporation (CAC®) has the practical knowledge to help customers improve their sustainability. A family owned company, CAC vigilantly protects a proud reputation for quality engineering, innovative design and attentive customer service. 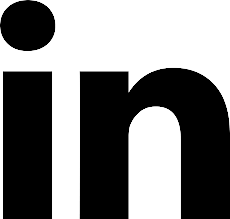 Nationwide experience with nearly every type of web converting has given CAC a deep reservoir of knowledge and the ability to anticipate industry trends and customer needs and priorities. Today, CAC is thoroughly engaged with contributing to the move toward more sustainable converting and more sustainable finished products. For example, CAC offers two outstanding product families that directly improve sustainability and may help converters help their customers improve their scores on the influential Wal-Mart Sustainability scorecard. The “scorecard” is a comprehensive system that rates every aspect of a package’s sustainability including materials, manufacturing techniques and shipping, and allows Wal-Mart to give shelf space preference to higher scoring products. WrinkleSTOP® Helps Down-Gauging; Reduces Waste. WrinkleSTOP® Spreader Rolls remove wrinkles with no web distortion, offer edge-to-edge adjustability, from 0% to 100% spread, while the web is in motion, require no special tools for adjustment and have a broad range of applications. WrinkleSTOP® Spreader Rolls improve overall versatility by extending the reach of materials that can be profitably run on most web operations. They are effective with laminating, slitting, printing, coating, textiles, paper, film and nonwoven production. “WrinkleSTOP® Spreader Rolls accept many materials at any wrap angle, even with extremely short lead-in and lead-out web distances, and really shows off its performance with thin gauge materials but works equally well with all materials and thicknesses,” Damour said. In independent performance evaluation tests, WrinkleSTOP® Spreader Rolls removed all the wrinkles, all the time, under rigorous conditions and proved to be the best performer in a broad field of subjects. WrinkleSTOP® Spreader Rolls offer both standard and custom sleeves to match most applications and features high-quality motor-grade bearings. The unique design and performance of CAC's FOX TrimAway®, and FOX Runner® trim removal systems can improve efficiency and reduce energy consumption in in-house waste management operations. FOX systems feature an adjustable venturi and blower system that allows customers to run the narrowest possible trim. In operations where trim is wound, trim widths must be wide enough to be wound in rolls. In the FOX system trim is transported by the blower / venturi to a collection area allowing converters to minimize the excess waste required by trim winding operations. Additionally, changing from a trim winding-based operation to a continuously operating FOX system makes an operation more efficient, and thus more sustainable, by eliminating production interruptions needed to change trim rolls or the even more awkward matrix rolls. CAC's employment of frugal energy consuming regenerative blowers in the FOX system allows for a major reduction of energy consumption when compared to systems that use energy gobbling compressors. Since these systems are available in four venturi sizes, with blowers of one to 15 horsepower, CAC is able to customize an entire system to precisely match a converter's requirements by operating continuously at the maximum speed of the web it serves need without resorting to energy wasteful over-sizing. CAC offers technology designed to perform at every critical point in a web. From the simplest aluminum core cone to the most sophisticated unwind/rewind solutions CAC products improve efficiency, help increase profits, reduce waste and energy consumption, allow reduction of material costs through down-gauging and, best of all, are readily available, cost effective, easy to install and are fully supported by an expert and dedicated team. “Major improvements do not always come from a single, expensive, dramatic addition. They are often the result of expert tweaking and the sum of several small enhancements. When we take a close look at the big picture of a web's performance we almost always spot a couple of critical spots where a small improvement will deliver a big result. Constant improvement, that's what sustainability is all about.” Damour concluded. Converter Accessory Corporation (CAC) has upgraded production capabilities with the purchase of a new, advanced computer controlled Clausing/METOSA CNC2080 lathe. The Clausing/METOSA CNC2080 will be used in production of CAC’s patented WrinkleSTOP® and Multi-Adjust WrinkleSTOP® linear, smooth surface, anti-wrinkle rolls; efficient FOX TrimAway® pneumatic trim, matrix and waste removal systems; the Patented COR-LOK®, light weight air shafts and chucks and the new pinch point free Shaft-LOK™ safety chuck. This is the third Clausing lathe CAC has purchased. Two other Clausing lathes have been on line in CAC’s Wind Gap, Pennsylvania headquarters for several years. The new Clausing/METOSA CNC2080 lathe was purchased through Action Machinery, Bethlehem, PA.
CAC, celebrating 30 years of success, designs, engineers and manufactures mechanical web handling equipment for converters of paper, film, foil, nonwovens and textiles. Engineered solutions include high quality, cost effective equipment including aluminum core cones, air shafts, trim removal, roll handling equipment, advanced technology wrinkle removal systems and more. For a new CD that gives detailed CAC product information, white papers and extensive resource information valuable to converters, call or email CAC. Trenton, South Carolina: Bondex, a Trenton, South Carolina manufacturer of nonwovens, solved two nagging production problems with mechanical solutions from a single source, Converter Accessory Corporation (CAC). The first problem was with an air shaft, button type design that clogged and became ineffective under production conditions. According to Charlie Waters, Bondex Production Manager, Bondex's nonwovens production was plagued by frequent disruption when material; fibers and dust, from roll cores built up in and then clogged the button type air bladder openings. Not only did this accelerate wear on the bladders, but also, as the openings became clogged, prevented firm, uniform contact between the buttons and the cores. Operation of the air shaft became ineffective, production had to be shut down and the air shafts serviced. Frequently, the bladders in the button type air shafts were too difficult to replace in house and had to be sent to the manufacturer for refitting. For Waters, the amount of downtime caused by air shaft failures was unacceptable. When salesman John Burch from Louis P. Batson Company, a Converter Accessory Corporation (CAC) agent, presented COR-LOK air shafts as an alternative, Waters was intrigued enough to give one a trial. Unlike button-type systems, COR-LOK air shafts and chucks feature a tubing design contoured to match the geometry of its unique, spiraled shaft body. These inflatable tubes are able to match and usually exceed the gripping power of other systems, including button-type. Importantly, so far as Waters was concerned, CAC's COR-LOK air shafts offer exceptionally easy maintenance and tube replacement. CAC's tubing fits all CAC air shafts and chucks. It can be ordered and stocked in advance and cut to length, on site, to match any COR-LOK air shaft. This feature is especially important in a facility using a diversity of air shaft and chuck sizes. The tubing itself is mechanically fixed to the air valve rather than vulcanized, and thus can be easily replaced by virtually any operator using simple hand tools. The tubing requires only 60 to 120 psi to fully inflate. After the first COR-LOK air shaft was installed and tested on Bondex's nonwovens production line, the results were so impressive that Waters decided to replace the remaining button-type systems with the CAC technology. The second production problem, less urgent but none-the-less a stewing annoyance in the background, was with a venturi trim removal system that sometimes clogged, was limited in how far it blew waste, and too limited in the volume of trim it could handle. Burch said he had a solution to the trim removal annoyance as well and introduced Bondex's Waters to CAC's Fox TrimAway ®venturi and blower based trim removal system. CAC offers 30 standard systems with blowers from 1 HP to 15 HP. All components are engineered to match each customer's specifications. Components include a unique, adjustable venturi, regenerative blower, pickup nozzle, Y connectors, collection centers, flexible ducts, motor starters, trim choppers, filters and silencers(if needed); it is a complete, ready-to-work trim removal system fully supported by readily available spare parts. ”Since we liked the air shaft and were impressed with the sensible engineering behind it, we were pleased to find the same common sense approach in the Fox TrimAway.“ Waters said. Waters says the FOX TrimAway runs quieter, handles more trim and heavier trim, sends it farther and is more reliable than the system Bondex had before. ”I don't think it ever clogs,“ Waters said. Converter Accessory Corporation (CAC) is introducing bowed rolls to its’ already extensive line of anti-wrinkle technology and devices. The new model FB350 bowed roll utilizes fixed bow technology, engineered to fit customers’ specific application(s). Fixed bow provides excellent aggressive, repeatable performance for the most demanding anti-wrinkle applications. It is also extremely well suited to separate slit widths for slitter rewinder applications, to prevent interleaving. The FB350 is currently available in versatile 3.5” diameter and face widths up to 70”. 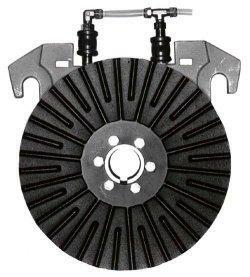 Drive sheaves are available for light tension applications. Rubber sleeve material may be varied where high heat, chemicals, adhesives or excessive ozone exposure may be a concern. Optional mounting blocks, designed for use with the FB350, allow for optimal bow placement in any application. According to Jeff Damour, CAC engineering manager, the inclusion of bowed rolls to an extensive anti-wrinkle product offering greatly enhances CAC’s ability to offer complete standard and customized solutions to eliminate web wrinkles in any converting process. The new FB350 bowed roll will join WrinkleSTOP, Multi-Adjust WrinkleSTOP, Adjusta-Pull, Angular Adjusta-Pull bracket, Scroll Roll and crowned and concave rollers to accommodate a truly complete and unique array of solutions to combat web wrinkles. According to Jeff Damour, CAC Engineering Manager, this new mounting bracket includes a cantilevered extruded aluminum slide rail frame allowing easy web width adjustment. The hand operated angle adjustment knob makes for easy side to side tuning of anti-wrinkle action. Four bolt mounting makes these mounting brackets extremely easy to mount. They may be purchased to accompany any new Adjusta-Pull applications or added to existing Adjusta-Pull nip type anti-wrinkle systems in the field. Simple, one bolt mounting of the Adjusta-Pull® system to the bracket is all that is required. Damour said: "We have designed these mounting brackets with ease of installation and versatility of use in mind. I highly recommend this mounting system for any Adjusta-Pull® anti-wrinkle application, new or already existing." Adjusta-Pull® nip type anti-wrinkle systems employ two opposing nip roll assemblies that are mounted to each edge of the web. The nip assemblies are angled away from each other. Each web edge will attempt to maintain a 90 degree entry angle to each Adjusta-Pull® nip assembly effectively pulling on each edge of your web, removing wrinkles. The system is a very simple answer to the very complex and expensive problem of web wrinkles. Any converter running webs of thin- and ultra-thin gauge material, including foil, may experience wrinkle problems. In general, there are at least two excellent solutions to wrinkle problems, but only one-expanding surface spreader rolls-is the preferred choice for converters running thin gauges. Expanding surface spreader rolls have proven to provide the best wrinkle removal for virtually any application in web widths 3-120 in. They are effective in any printing, coating, or laminating operation, and their performance is especially noteworthy when applied to thin-gauge film and foil. An impartial examination and evaluation of the performance of all wrinkle-removing systems came in a definitive study published in a bound edition, edited by J.K. Good, of the Fourth Intl. Conference of Web Handling, held June 1-4, 1997, at the Web Handling Research Center, Oklahoma State Univ., Stillwater, OK. The specific study, “Testing and Analysis of Web Spreading and Anti-Wrinkle Devices” by R.P. Swanson, 3M Co., (pp414-428), found “the expanding surface rollers did not wrinkle under any test conditions. The regime I performance was excellent. This roller is an aggressive web-spreading device. An expanding surface roller would be insensitive to wrinkles at low, medium, and high tensions. This roller is an excellent, high drag, web spreading and anti wrinkle device.” (p421). Of the ten types of systems tested, only the expanding surface spreader rolls and the “curved axis” or bowed roll systems were described as “excellent” systems according to the study. 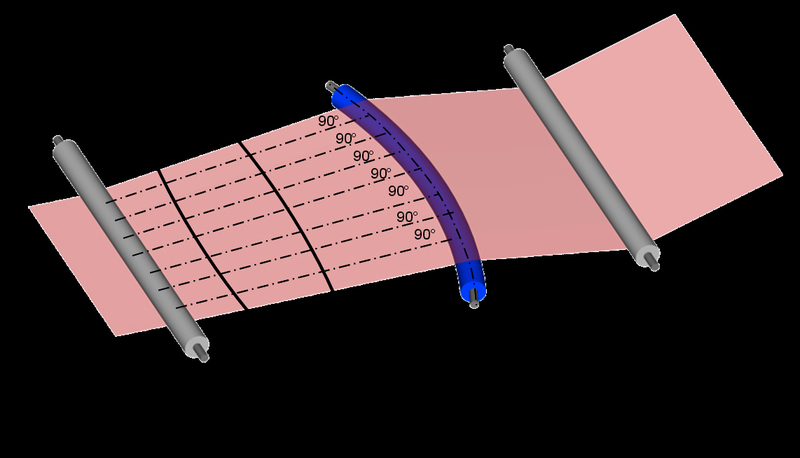 The single distinguishing drawback of bowed spreader rolls, compared to expanding surface spreader rolls, is the potential web-distorting effect built into the design (See Figures 1 and 2). The arc itself, the core of the design principle, has the potential of stretching and even tearing the center of the web. With many materials, depending on the amount of distortion, this may not be an issue. But with very thin gauges, as is often the case with foils and films, the capacity to absorb any distortion of materials is limited. Tears and stretching may result, and the impaired quality may be more noticeable than it might be with other materials. When compared to bowed spreader rolls, the only other system to receive an “excellent” in the Swanson study, the expanding surface spreader roll is distinguished by its ability to maintain a constant tension profile while acting on the web. Let’s take a look at a typical expanding surface spreader roll. This example (same example as the Swanson study) employs a stretchable rubber sleeve supported by a series of rubber support disks. On each end of the sleeve, there are end collars mounted on bearings and an adjustable axle. The end collars clamp and hold the sleeve in place. Importantly, however, the end collars are canted to a mechanically adjustable degree, and it is this cant that provides the contracted and expanded pattern of the stretching section of the roll. (See Figures 3 and 4). Essentially and simply, during production the web continually stretches from the short side of the rubber sleeve to the long side. 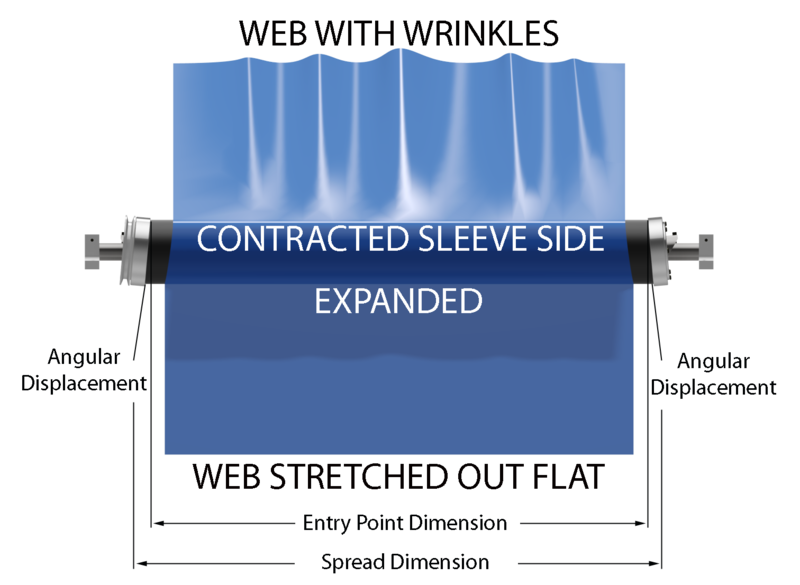 The material enters the roll at the point where sleeve expansion begins and exits at a point prior to sleeve contraction. The desired spreading action is achieved without distortion of the web. Wrinkle removal comes from the expanding action evenly distributed across the web. The amount of expansion may be adjusted at each end of the web – continually, if necessary – to compensate for distortions derived from changing up-stream conditions. This type of spreader is an aggressive wrinkle-removal device. Spreading amount is adjustable from- 0%-100%. Adjustments can be made from each end of the roll while the machine is running. The recommended wrap angle for this roll is from 90°-180°, the greater the wrap angle, the greater the stretch. For converters of thin-gauge materials, or where consistent gauge and unmarred surfaces are especially important, the expanding surface spreader roll maintains an even tension across the surface and does not distort or tear the center or edges of a web. Also, the smooth surface does not mar, scratch, or distort web surfaces. With a couple of minor caveats (the system does not distribute the stretch across the web perfectly, and its effectiveness may be inhibited at extremely fast web speeds), the expanding surface spreader roll has proven to be the most effective wrinkle-removal system available for thin-gauge materials. It is true almost every spreader roll will remove some level of wrinkles, and a converter’s selection of a system should be guided, in part, by the degree of wrinkle removal desired and, in part, by the amount of distortion converters and their customers can tolerate. While both bowed roll and expanding surface spreader rolls offer an excellent performance, when it comes to thin- and ultra-thin gauge materials and when quality is paramount, the expanding surface spreader roll is the preferred choice. Jeff Damour is the engineering manager at Converter Accessory Corporation, Wind Gap, PA. He has been with CAC for 17 years and has published several technical articles covering a wide range of web handling applications. Jeff has the honor of presenting web spreading technology for converters at the Slitting and Rewinding Fundamentals and Coating and Laminating seminars run by Converting Equipment Mfrs. Assn. (CEMA). Contact Jeff at 800-433-2413; jdamour@converteraccessory.com. The views and opinions expressed in Technical Reports are those of the author(s), not those of the editors of PFFC. Please address comments to author(s). WrinkleSTOP® Spreader Rolls can help converters and their customers offer more sustainable products. WrinkleSTOP® has a proven ability to improve the quality of web production, reduce waste and effectively run thinner gauge materials. With material costs skyrocketing and new demands for “greener” products converters are facing new challenges to their ability to compete profitably. Since the Wal-Mart sustainability scorecard went into effect in February, sustainability pressure on converters participating in the packaging markets has significantly increased. The “scorecard” is a comprehensive system that rates every aspect of a package's sustainability including materials, manufacturing techniques and shipping, and allows Wal-Mart to give shelf space preference to higher scoring products. Converter Accessory Corporation (CAC) has produced a WrinkleSTOP® 3000 for beta installation in a fortune 500 company. 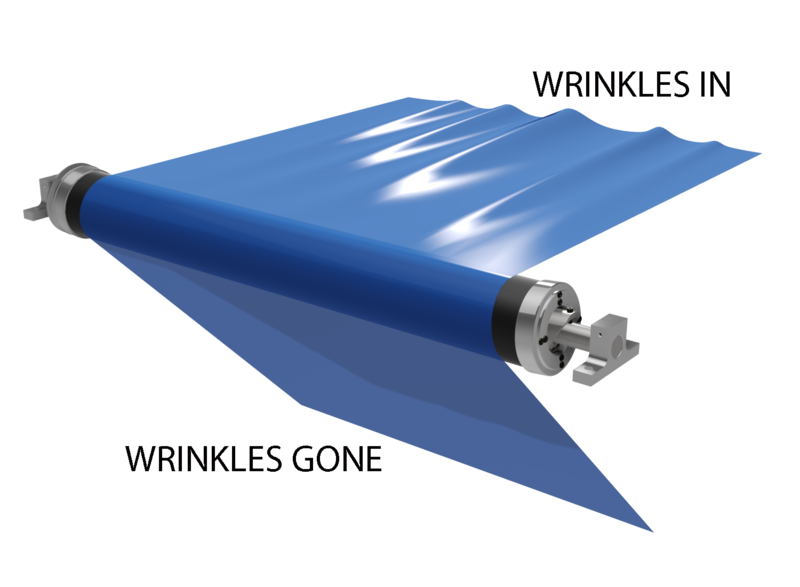 The new WrinkleSTOP® 3000 anti-wrinkle rolls are engineered to be compatible with web production speeds up to 3000 feet per minute, doubling the speed capabilities of previous versions. WrinkleSTOP® 3000 anti-wrinkle rolls are available in 8 inch diameters and widths up to 200 inches. The 8 inch diameter, 72 inch face beta version is custom engineered to match the customer's requirements. More than 2000 previous versions of WrinkleSTOP® are successfully in use in North America. In addition to improving quality and significantly reducing scrap, in some cases to zero, WrinkleSTOP® anti-wrinkle rolls have consistently allowed an overall increase in line speeds. According to Jeff Damour, Engineering Manager, WrinkleSTOP® anti-wrinkle rolls remove wrinkles with no web distortion, offer edge-to-edge adjustability, from 0% to 100% spread, while the web is in motion, require no special tools for adjustment and have a broad range of applications. WrinkleSTOP® anti-wrinkle rolls improve overall versatility by extending the reach of materials that can be profitably run on most web operations. WrinkleSTOP® anti-wrinkle rolls are effective with laminating, slitting, printing, coating, textiles, paper, film and nonwovens production. In a recent independent performance evaluation test, WrinkleSTOP® anti-wrinkle rolls removed all the wrinkles, all the time, under rigorous conditions and proved to be the best performer in a broad field of subjects. All WrinkleSTOP® anti-wrinkle rolls offer both standard and custom sleeves to match most applications and feature high-quality motor-grade bearings. ”Most converters are always interested in technology that will allow them to go thinner, faster and wider. Our newest WrinkleSTOP® anti-wrinkle rolls were developed to match these demands for top performance at high speeds in wider webs. WrinkleSTOP®, in all configurations, remains the best wrinkle removing upgrade for web processing under all conditions, including the widest range of materials at any wrap angle, even those with extremely short lead-in and lead-out web distances,“ Damour said. Currently celebrating its 32nd year of success, Converter Accessory Corporation designs, engineers and manufactures web handling equipment for converters of paper, film, foil, nonwovens and textiles. Engineered solutions include high quality, cost effective equipment from the simplest aluminum core cone to the most sophisticated unwind/rewind system. CAC is represented by knowledgeable sales engineers and provides extensive consultation and post sales support. For more information contact Jeff Damour, Converter Accessory Corporation, 201 Alpha Road, Wind Gap, PA 18091-1279, (800) 433 2413, fax (610) 863 7818, or click above to chat with an on-line sales engineer. Converter Accessory Corporation's (CAC) new Adjusta-Pull® web spreading system is a remarkably efficient and cost effective approach to wrinkle removal and web spreading. Adjusta-Pull is an aggressive system, especially effective with nearly all textiles and nonwovens as well as paper and film applications. According to Pam Damour, CAC General Manager, the entirely mechanical system employs the web principle that a web will seek a 90° angle to a roll in its entry span to that roll. Adjusta-Pull® consists of two opposing nip roll assemblies that use this principle to impose a consistent, controlled outward draw on the web material. Easily adjusted angular displacement, relative to the direction of the web flow, influences the amount of draw and thus allows regulation of the amount of spreading action. Ball bearing mounted Adjusta-Pull® nip rolls in nine and six inches come in standard one rubber/ one aluminum configurations, but may be supplied with virtually any covering, including plasma, silicone, urethane, Teflon, etc., for spreading materials with special requirements. For additional web spreading, Adjusta-Pull® can be arranged in sequences of multiple pairs. In addition to Adjusta-Pull®, CAC has several other types of wrinkle removal systems, including the widely successful WrinkleSTOP®. CAC's product diversity allows customers to select optimal wrinkle removal technology for each application. Founded in 1974, Converter Accessory Corporation designs, engineers and manufactures web handling equipment for converters of paper, film, foil, nonwovens and textiles. Engineered solutions include high quality, cost effective equipment from the simplest aluminum core cone to the most sophisticated unwind/rewind system. CAC is represented by knowledgeable sales engineers and provides extensive consultation and post sales support. FOX Runner®, Converter Accessory Corporation’s (CAC) exceptionally popular portable pneumatic trim removal system is now available with CAC’s new variable speed blower control. This combination allows for the ultimate in energy efficient pneumatic trim removal. According to Jeff Damour, Engineering manager, “The portability of FOX Runner allows it to be used where ever it will have the most impact in your plant. Now, combined with CAC’s new variable speed blower control, FOX Runner offers the ultimate in energy savings and convenience for pneumatic trim removal”. The FOX Runner is stable enough to put in place for long term trim handling or it can be easily transported to new locations and rapidly set up and put to work. In many cases FOX Runner’s portability can save converters the need to purchase multiple trim removal systems. FOX Runner uses CAC’s long time successful FOX TrimAway® pneumatic trim removal components mounted to a portable stand for permanent, semi-permanent and temporary applications. It is offered as a complete, turnkey system that can be readily and quickly integrated in any trim removal application. FOX Runner portable systems include CAC’s exclusive venturi design, a regenerative blower, blower hardware and filter, motor starter with plug and cord. Additionally, the system includes pick-up nozzles, Y connectors, duct work and high torque duct clamps. All FOX components are mounted to a tubular steel frame with locking caters. Optional components available are collection bags and bins, silencers and additional duct for long conveying distances. The soft starting feature built in to these VSD’s will start the blower motor with a smooth, linear acceleration of a programmed time. The advantage when compared to standard blower starters is there is no sudden inrush of current that puts large demand on power lines. Soft starting eliminates stress on electrical and mechanical components. Maintenance costs are reduced and lifetime of system blowers extended. High starting currents and voltage dips in the supply network, which might cause process disturbances, are eliminated. Designed to handle trim widths up to 4 inches at speeds up to 3,000 feet per minute, FOX Runner will include the proper components to handle your needs. FOX Runner will efficiently remove paper, film, foil, textile and non-woven webs. They are designed to be exceptionally easy to operate, quiet and frugal consumers of electricity. Converter Accessory Corporation now offers a new variable speed drive (VSD) option with all models of their popular, industry proven FOX TrimAway® pneumatic trim removal systems. This new VSD includes built-in soft starting to accelerate the blower motor in a smooth linear fashion. CAC offers over 30 standard FOX TrimAway® systems. All may be customized to handle the most demanding trim removal application. CAC manufactures centralized, modular and FOX Runner® portable pneumatic trim removal systems. The unique design and performance of Converter Accessory Corporation’s (CAC®) FOX TrimAway®, and FOX Runner® trim removal systems can improve efficiency and reduce energy consumption in web converters’ waste management operations. Improved efficiency and reduced waste and energy consumption improve the overall sustainability of any converting operation and may help improve scores on the influential Wal-Mart sustainability score card for converters and their customers participating in consumer packaging markets. Fox's features an adjustable venturi and blower system that allows customers to run the narrowest possible trim. In operations where trim is wound, trim widths must be wide enough to be wound in rolls. In the FOX system trim is transported by the blower / venturi to a collection area allowing converters to minimize the excess waste required by trim winding operations. Additionally, changing from a trim winding-based operation to a FOX system makes an operation more efficient, and thus more sustainable, by eliminating production interruptions needed to change trim or awkward matrix rolls. CAC’s employment of frugal energy consuming regenerative blowers in the FOX system allows for a major reduction of energy consumption when compared to systems that use energy gobbling compressors. Since these systems are available in four venturi sizes, with blowers of one to 15 horsepower, CAC is able to customize an entire system to precisely match a converter’s requirements by operating continuously at the maximum speed of the web it serves need without resorting to energy wasteful over-sizing. FOX systems readily integrate with recycling machinery and can be supplied with CAC choppers when needed. FOX facilitates recycling by conveying trim waste without adding contamination, easily cleanly conveying even adhesive materials to a collection point or to recycling machinery. Jeff Damour, CAC engineering manager, says CAC’s business philosophy has always been based on making web operations more efficient and thus more sustainable while increasing profits. “In the web converting industry doing what is good for the environment is also good for business,” Damour said. About FOX TrimAway® Made in the USA, FOX TrimAway® and the FOX Runner® are engineered for efficient trim removal during production or converting of most web materials including, paper, film, foil, board, nonwovens and textiles. They are effective with trim ranging from 1/16“ to 6“ widths and can operate at speeds up to 4000 feet per minute. FOX systems can be supplied with a CAC chopper and can operate as a single installation or as a coherent system consisting of several FOX TrimAway® systems. A complete CAC FOX TrimAway® system includes all required parts and components needed to begin efficient trim removal. In most cases installation takes less than an hour. The versatile FOX Runner® is a portable version of the FOX TrimAway® that can be quickly engaged and disengaged and easily rolled, on built-in wheels, from one production line to another, as needed. All CAC FOX systems are modular constructions sized to customer requirements. All components are engineered to match each customer’s specifications. Litin Paper Company, Minneapolis, Minnesota, a seasoned, family owned company with years of converting, experience turned to Converter Accessory Corporation (CAC), Wind Gap, Pennsylvania, also a family owned company with decades of experience, for a portable system able to efficiently remove large amounts of trim from several production lines. In business since 1947, Litin is a converter and wholesale distributor of packaging and industrial supplies. With 32 employees the company operates six converting lines performing cutting, slitting and rewinding in both small and wide diameters. Production includes sheeting, producing packaging paper, counter rolls, butcher, plotter, wax coated, and silicone coated paper, and newsprint. With so many products diverse in gauge and weight, Litin needed a versatile system, one able to handle the heavy kraft trim as well as the very light, thin-gauge papers and plastics. According to John Hanson, Litin Vice President/General Manger, handling trim waste, while in itself not a major problem, was a nagging annoyance made worse by Litin’s rapid growth rate. ”We wanted a way to efficiently collect diverse trim materials and move them easily from a production line to a collection area. We wanted the solution to be priced to fit our budget, easy to install and maintain and able to be moved from line to line, where needed“ Hanson said. After a thorough search Litin contacted CAC and became convinced that the Fox Runner™ version of the widely used Fox TrimAway® system was the best option and ordered an FX2-700R, capable of pneumatically moving trim up to a hundred feet. The Fox Runner™ uses CAC’s widely employed Fox TrimAway® pneumatic trim removal components mounted to a portable stand for permanent, semi permanent and temporary applications. The complete Fox Runner™ portable system includes CAC’s exclusive venturi design; a regenerative, exceptionally quiet, virtually maintenance free blower; all the blower hardware, motor starter plug and cord, blower filter. Additionally, the system includes pick-up nozzle(s) and Y connectors; 10-foot standard intake and discharge ducts with high torque duct clamps; complete welded tubular steel system mounting frame and locking casters. Options include collection units such as high-capacity nylon bags and metal collection bins, and discharge ducts over 100 feet long. Fox Runner™ systems are designed to handle trim widths ranging up to two and six inches, at speeds up to 6000 feet per minute, depending on the Fox system size. The Fox Runner™ is engineered to efficiently remove paper, film, foils, textile and non-woven trims. It is especially effective with more difficult to handle die cutter waste as well as chopped, granulated and pelletized materials. According to John Hanson, the Fox Runner™ was easy to install and delivered the versatility, energy efficiency, and low maintenance that Litin required. ”It is stable enough to put in place for long term trim handling or it can be easily wheeled to multiple locations throughout the plant and rapidly set up and put to work wherever it is needed,“ Hanson said. Are you considering modifying or replacing existing slitting equipment? If you are, it is always a good idea to send samples to your potential slitting equipment supplier. Generally speaking, slitting equipment suppliers have some amount of testing equipment at their facility. They can run your samples (even if it is just hand feeding them into a slitter) which will help to determine the best slitting solution for your web and process. When sending samples to a supplier make sure to send samples of all of the webs you will potentially run in your process. The slitting equipment supplier may recommend one or more slitting methods base solely on the samples they have in hand. Be very careful of selecting a slitting system for which samples have not been tested. Introducing the FOX TrimAway® and the FOX Runner® systems engineered for efficient trim removal during production or converting of most web materials including, paper, film, foil, board, nonwovens and textiles. It is effective with trim ranging from 1/16“ to 6“ widths and can operate at speeds up to 4000 feet per minute. The venturi-based FOX TrimAway® system includes a Gast® Regenerative Blower and a unique, adjustable venturi. It transports waste to any waste collection point and can be integrated with recycling equipment. The system can operate as a single installation or as a coherent system consisting of several FOX TrimAway® systems. A complete CAC® FOX TrimAway® system includes all required parts and components needed to begin efficient trim removal. The versatile FOX Runner® is a portable version of the FOX TrimAway® that can be quickly engaged and disengaged and easily rolled, on built-in wheels, from one production line to another, as needed. The FOX TrimAway® system is especially advantageous when employed for removal of difficult to wind narrow trim widths and thin gauge products. In such applications, FOX TrimAway®: systems have paid for themselves very quickly by freeing manufacturers from the need to product waste in wider than necessary, easily wound widths, according the Jeff Damour, CAC® Engineering Manager. FOX TrimAway® systems are designed to be exceptionally easy to install and easy to operate. They are quiet, frugal consumers of electricity, especially when compared to systems that rely on energy gobbling compressed air. ”Energy efficiency is derived in part from not requiring a compressor. Being compressor free also contributes to the quiet operation of the FOX TrimAway®. Though we offer silencers, the system, without silencers, is complete OSHA compliant,“ Damour said. All FOX TrimAway® systems are modular constructions sized to customer requirements. CAC® offers 30 standard systems with blowers from 1 horsepower to 15 horsepower. All components are engineered to match each customer's specifications. Components include a unique, adjustable Venturi, Gast® Regenerative Blower, pickup nozzle, Y connectors, collection center, flexible ducts, motor starters, trim choppers, filters and silencers if needed. In short, Damour says, we deliver a complete ready-to-work trim removal system fully supported by readily available spare parts. FOX Runner® , Converter Accessory Corporation’s (CAC®) recently introduced, portable system for trim removal, is proving to be extraordinarily successful. Jeff Damour, CAC Engineering Manager, attributes the demand to converters concerned about unstable material prices searching for effective ways to cut costs. FOX Runner eliminates the need to wind trim and allows converters to run the narrowest trim possible without the well known difficulties of maintaining a thin width trim roll. The result of trim width reduction is less waste. In a multi web plant, the portability of the FOX Runner allows it to be used wherever it will have the most impact. The FOX Runner is stable enough to put in place for long term trim handling or, if a line is down for repairs or maintenance, for example, it can be easily wheeled to new locations throughout a plant and rapidly set up and put to work wherever it is needed. In many cases the FOX Runner’s portability can save converters from the need to purchase multiple systems. The FOX Runner uses CAC’s long time successful FOX TrimAway® pneumatic trim removal components mounted to a portable stand for permanent, semi permanent and temporary applications. It is offered as a complete, turnkey system that can be readily and quickly integrated with a running web. The complete FOX Runner portable system includes CAC’s exclusive venturi design; a regenerative, exceptionally quiet, virtually maintenance free blower; all the blower hardware, motor starter plug and cord, blower filter. Additionally, the system includes pick-up nozzle(s) and Y connectors; 10-foot standard intake and discharge ducts with high torque duct clamps; complete welded tubular steel system mounting frame and locking casters. Options include collection units such as high-capacity nylon bags and metal collection bins, and discharge ducts over 100 feet long. FOX Runner systems are designed to handle trim widths ranging up to 1 to 4 inches at speeds 100 to 3000 feet per minute. The FOX Runner is engineered to efficiently remove paper, film, foils, textile and non-woven trims. It is especially effective with more difficult to handle die cutter waste as well as chopped, granulated and pelletized materials. The FOX Runner can be readily integrated with most plastics recycling equipment for a complete, seamless and profitable waste reclaim system. All FOX systems are designed to be exceptionally easy to install and easy to operate. They are quiet, frugal consumers of electricity, especially when compared to systems that rely on energy gobbling compressed air. All FOX systems feature modular constructions sized to customer production requirements. CAC offers FOX technology in over 30 standard systems. Converter Accessory Corporation’s (CAC®) new Trim-AX™ chopper for chopping nearly every type of web waste trim materials is a two bladed unit capable of 3,450 cuts per minute with a 1,725 rpm motor. It features variable speed control. Thanks to extra heavy duty construction, with a dual bearing support, the system is exceptionally stable and runs quietly. Rotating blades are easily changed and are readily available from CAC®. Trim-AX™ has proven capable of handling materials ranging from heavy carpet to very light, 1/2 mil thick materials, including paperboard, paper, nonwovens PE, and nylon. It has proven especially effective reclaiming carpet edge trim, cutting it into sizes that allow easy transportation through a blower based venturi system. Now offered as a separate component, Trim-AX™ was originally designed to work smoothly with CAC’s family of Fox TrimAWAY™ trim removal systems. The Trim-AX™ can easily be integrated to enhance operation of most venturi air conveying waste removal systems. According to Jeff Damour, CAC® Engineering Manager, CAC’s Fox systems do not need a chopper to be effective. However, the Trim-AX™ can allow an air conveyor system to work over longer distances, over 200 feet with a Fox system, for example. The Trim-AX™ also makes waste handling more efficient and chopped trim takes less space in collection bins. ”Customers told us they were not satisfied with the choppers that were available. They asked us to find the best option and after examining the possibilities, we decided to design and build our own. Converters who are looking to blow trim longer distances, have limited storage space, or who want size reduced trim for reprocessing efficiency should give careful consideration to the Trim-AX™. It’s an exceptionally well designed unit and is built to last,“ Damour said. The Trim-AX™ is an optional component of CAC’s large offering of Fox trim removal systems. CAC offers 30 standard systems with blowers from 1-horsepower to 15-horsepower. All components are engineered to match each customer’s specifications. In addition to the Trim-AX™ components include a unique, adjustable Venturi, Gast® Regenerative Blower, pickup nozzle, Y connectors, collection centers, flexible ducts, motor starters, filters and silencers if needed. Minneapolis, Minnesota: Litin Paper Company, Minneapolis, Minnesota, a seasoned, family owned company with years of converting, experience turned to Converter Accessory Corporation (CAC®), Wind Gap, Pennsylvania, also a family owned company with decades of experience, for a portable system able to efficiently remove large amounts of trim from several production lines. In business since 1947, Litin is a converter and wholesale distributor of packaging and industrial supplies. With 32 employees the company operates six converting lines performing cutting, slitting and rewinding in both small and wide diameters. Production includes sheeting, producing packaging paper counter rolls, butcher paper, plotter paper, wax coated paper, silicone coated paper, and newsprint. With so many products diverse in gauge and weight, Litin needed a versatile system, one able to handle the heavy kraft trim as well as the very light thin gauge papers and plastics. Converter Accessory Corporation (CAC®) announces the portable trim removal system FOX Runner® is now available in a new size, the FX1.5. The FX1.5 fills an important niche in the previously very wide gap between the small FX1 and the exceptionally powerful FX2. The portable FOX Runner® FX1.5 can handle up to 2 inch wide trim at speeds to 2000 feet per minute, while the larger FX2 can run at speeds to 6000 fpm. In installations where 2000 fmp is an optimal speed, the FX1.5’s small size contributes to its unobtrusive installation in locations that would not accommodate a larger system and also offers more energy efficiency. The FOX Runner® uses CAC’s® widely employed FOX TrimAway® pneumatic trim removal components mounted to a portable stand for permanent, semi permanent and temporary applications. The complete FOX Runner® portable system includes CAC’s® exclusive venturi design; a regenerative, exceptionally quiet, virtually maintenance free blower; all the blower hardware, motor starter plug and cord, blower filter. Additionally, the system includes pick-up nozzle(s) and Y connectors; 10-foot standard intake and discharge ducts with high torque duct clamps; complete welded tubular steel system mounting frame and locking casters. Options include collection units such as high-capacity nylon bags and metal collection bins, and discharge ducts over 100 feet long. FOX Runner® systems are designed to handle trim widths ranging up to 2 to 6 inches at speeds up to 6000 feet per minute. The FOX Runner® is engineered to efficiently remove paper, film, foils, textile and non-woven trims. It is especially effective with more difficult to handle die cutter waste as well as chopped, granulated and pelletized materials. What distinguishes the FOX Runner®, according to Jeff Damour, CAC® Engineering Manager, are a high-speed production, versatility, energy efficiency, low maintenance and easy installation. The FOX Runner® can be readily integrated with most plastics recycling equipment for a complete, seamless and profitable waste reclaim system. All FOX TrimAway® systems are designed to be exceptionally easy to install and easy to operate. They are quiet, frugal consumers of electricity, especially when compared to systems that rely on energy gobbling compressed air. All Fox systems feature modular constructions sized to customer production requirements. CAC® offers Fox technology in over 30 standard systems. CAC® is introducing the Fox Combo™, a new, factory assembled, combination trim removal and chopper system that ships as a single complete unit. The Fox Combo™ combines the widely employed, venturi-based Fox TrimAWAY® with CAC’s recently introduced TrimAX™, a two bladed chopper capable of 3,450 cuts per minute. The two systems are both mounted on a sturdy, but moveable framework and are designed to be used together or independently. The Fox Combo™ system is designed for the 5 1/2 to 15 horsepower, FX2 and FX3 Fox TrimAWAY® systems. These systems handle materials from 1/2 mil to heavy carpet in widths to 6 inches at speeds to 3000 feet per minute. The entire system can be moved from one production line to another with a power jack. According to Jeff Damour, CAC Engineering Manager, the Fox Combo™ is especially adept at chopping and moving bulky trim waste material to a waste collection point. ”This is a versatile system built in response to customers requests for a single Fox type unit with a compatible, mounted chopper for handling a variety of materials, especially heavy paper trim waste,“ Damour said. CAC® offers 30 standard Fox systems with blowers from 1-horsepower to 15-horsepower. All components are engineered to match each customer’s specifications. Components include a unique, adjustable Venturi, Gast® Regenerative Blower, pickup nozzle, Y connectors, collection centers, flexible ducts, motor starters, trim choppers, filters and silencers if needed. A combination of venturi-based trim remover and high-output chopper in a single pre-wired and moveable frame was developed by CAC. Called Fox Combo, it can be installed and used within minutes and moved within a plant. It uses either a 5.5, 10 or 15 hp Fox TrimAway venturi blower system with a recently developed TrimAX 2-blade chopper, capable of 3,200 cuts/min. of film, sheet or carpet edge trim up to 6 inches wide, running up to 3,000 ft/min. The combo has two starters, so the venturi can also run alone, bypassing the chopper. The first was delivered in March. Eight months ago CAC also began to offer its TrimAway venturi in a moveable frame, calling that the FoxRunner. Looking for new ways to cut costs? One place to look is at your trim or scrap removal system. A very popular method of modular trim/scrap removal system includes a venturi which uses compressed air to operate. The attraction of this type of venturi system is its initial low cost. These venturis are very simple, small and relatively easy to manufacture, so the initial cost of the venturi itself is very low. Since this type of venturi uses compressed air to operate, there is no external power source (blower) to purchase, so again initial cost is kept low. Seem too good to be true? It is. While the initial cost of these types of modular trim/scrap removal systems will keep your purchasing department happy, long term costs will negate and surpass your savings. Compressed air is designed to operate equipment which requires very high pressure, very low volume. As a rule of thumb, it is never advisable to exhaust compressed air into atmosphere, which is exactly what you’re doing when you use this type of venturi trim/scrap removal. Why? Because compressed air volume is very expensive in energy consumption and maintenance when compared to blower air volume. Also, other areas of your plant operation may be negatively effected downstream of a venturi compressed air system that strains the compressor, dumping valuable compressed air into the atmosphere. Use a venturi trim/scrap removal system which utilizes a blower to avoid the yearly energy and maintenance costs of over using your air compressor. Venturi systems which utilize blowers cost more initially but the savings, over time, of relieving your air compressor of the responsibility of powering the system will most likely more than pay for the venturi/blower system in less than one year. In some cases, savings are around $10,000 in a single year. CAC® (Converter Accessory Corporation) adds a new, uniquely designed air chuck to its proven line of COR-LOK® air and mechanical chucks. This new COR-LOK-XE® model air chuck utilizes a pneumatically expanding, spirally wrapped external element to engage the core. These chucks are available for 2" - 18" diameter cores and use split bushings to lock to thru shafts for fast and easy placement and installation. According to Jeff Damour, CAC's engineering manager, COR-LOK-XE® pneumatic chucks are effective with virtually all types of cores in light to heavy duty applications. CAC's unique split bushing design clamps and releases quickly and easily, holding the COR-LOK-XE® model chuck securely in place and will not mark or damage the thru shaft to which it is mounted. CAC's® new COR-LOK-XE® model air chucks offer our customers a cost effective, simple answer to demanding applications where effective core holding is required. They are designed with standard, universal parts, so no matter what diameter air chucks our customers use; all parts remain consistent for all sizes. These chucks are designed to last with extremely limited maintenance. However, when maintenance is required, it is done with standard, stocked parts in less than 15 minutes.® Damour said. COR-LOK-XE® pneumatic chucks feature a tubing (bladderless) design, contoured to match the geometry of the company's unique, spiraled shaft body. The contoured tubing allows exceptional, even gripping torque across the full length of the chuck, an extremely long tubing life and easy replacement. To inflate, they only require 70 PSI and can easily handle up to 120 PSI. COR-LOK-XE® air chucks feature unique, wear resistant external element locking system and ensure zero core damage. All models are lightweight and designed for easy, safe operation. CAC (Converter Accessory Corporation) is offering new core adapters with the company's proven COR-LOK® core support technologies. The system uses sleeve based technology featuring CAC's unique split bushing locking design. COR-LOK® core adapters operate to handle core sizes from 2 up to 18 inches in diameter (3 and 6 inch being the most popular). According to Jeff Damour, CAC's engineering manager, COR-LOK® core adapters are effective with virtually all types of air shafts and thru shafts. CAC's unique split bushing design clamps and releases quickly and easily. It holds the core adapter securely in place and will not mark or damage the air shaft or thru shaft support. "CAC's new COR-LOK® core adapters offer our customers a cost effective, simple answer to a potentially difficult problem. When the need arises to run larger core diameters than a particular unwind or rewind setup can handle, CAC COR-LOK® core adapters can be used to effectively handle those larger cores." Damour said. These new core adapters are covered in CAC's new COR-LOK® Core Adapters brochure and on CAC's website on the Core Adapters page. Contact us at 800-433-2413 to receive the brochure. COR-LOK® pneumatic shafts, chucks and core adapters feature a tubing (bladderless) design, contoured to match the geometry of the company's unique, spiraled shaft body. The contoured tubing allows exceptional, even gripping torque across the full length of the core, a extremely long tubing life and easy replacement. COR-LOK® systems also offer several air valve options intended to match any application requirement. To inflate, they only require 70 PSI and can easily handle up to 120 PSI. COR-LOK® air shafts, chucks and core adapters feature unique, wear resistant aluminum leaf locking system and ensure zero core damage. All models are lightweight and designed for easy, safe operation. Converter Accessory Corporation (CAC®) is introducing a lateral adjust option with its COR-LOK® air shafts for cantilevered installations in narrow web applications. The lateral adjust option is built into the air shaft and an easily and safely operated handwheel facilitates side to side +/- 4 inch adjustments while the machine is running and production continues. The system includes CAC's exclusive adjustable core stop flange. The air shaft can be inflated through a rotary union via CAC's patented remote toggle valve, or with an air gun. COR-LOK air shafts with the lateral adjust option feature all the standard engineering features of the standard COR-LOK systems, including a tubing (bladder) design contoured to match the geometry of the company's unique, spiraled shaft body. All COR-LOK air shafts and chucks offer exceptional gripping power over the full core length; feature a unique, wear resistant aluminum leaf locking system, and ensure core protection and damage free operation. They are lightweight and carefully designed for easy, safe operation. Additionally, lateral adjust COR-LOK systems are easily cleaned and are designed for use in food-grade operations. Lateral adjust COR-LOK air shafts are available in 2 to 12 inch standard diameters and are capable of handling 500 lbs at speeds to 2000 feet per minute. According to CAC General Manager Pamela A. DiFrancesca, lateral adjust COR-LOK air shafts address growing market demands for systems that facilitate continuous production and reduce down time. Converter Accessory Corporation (CAC®) is introducing a patented new inflation toggle valve COR-LOK® air shaft option, toggle valve COR-LOK air shaft, that helps reduce roll changeover times. Toggle valve COR-LOK air shaft employs standard rotary union for pneumatic hook-up and is specifically engineered for use in cantilevered applications. It is available in COR-LOK air shafts in 2 to 18 inch diameters. According to Jeff Damour, CAC engineering manager, the main advantage of the toggle valve COR-LOK air shaft is that it facilitates rapid roll changeovers. Since the easily reached toggle valve is built into the end of the air shaft, an operator does not have to leave the station to access a remote inflation control or retrieve any tools. The toggle valve COR-LOK air shaft system is also compatible with CAC's sleeve-based core adapting option that allows converters to run varying core sizes, both 3“ and 6“ for example, on the same shaft or air shaft. This option allows rapid changeovers between rolls with differing core diameters ranging from 3 to 18 inches. CAC's sleeve-based core adapting system is especially effective in label production and other narrow web operations. It offers converters the additional economical option of employing two short sleeves at each end of the shaft rather than a single, longer sleeve to adapt varying core sizes. The most recent COR-LOK air shafts and chucks feature a freshly engineered tubing (bladder) design contoured to match the geometry of the company's unique, spiraled shaft body. Compared to previous designs, the economical new contoured tubing allows increased gripping power, a longer tubing life and exceptionally easy replacement. The new COR-LOK air shaft and chuck systems also offer several air valve options intended to match virtually any plant requirements. To fully inflate, they require only 90 to 120 PSI. COR-LOK tubing is unique in that it can be quickly and easily sized, on site, to match any CAC air shaft or chuck. Tubing lengths can be ordered in advance and stocked, thus minimizing down time, even in plants where a large diversity of air shafts and chuck sizes exists. To facilitate easy changeovers, the tubing is mechanically fixed, rather than vulcanized, to the air valve. All COR-LOK air shafts and chucks offer exceptional gripping power over the full core length; feature a unique, wear resistant aluminum leaf locking system, and ensure core protection and damage free operation. They are lightweight and carefully designed for easy, safe operation. CAC hosts an online air shaft support center featured on www.handleyourweb.com offering detailed instruction for servicing air shafts from CAC and other manufacturers. The air shaft support center allows for online ordering of spare parts, including aluminum core cones, tubing, valves and valve cores. Converter Accessory Corporation (CAC) introduces its new line of unwind and rewind modules. SimpLok™ unwind and rewind modules are the perfect answer where converters want to increase capacity, improve web control, ease roll changes for increased production or for adding unwind or rewind stations to an existing converting machine. SimpLok shaft holders and unwind / rewind modules are available in standard, medium and heavy duty. They handle rolls from 50 – 5,000 pounds. Unwind and rewind shafts are captured with ball bearings to ensure optimum tension control. SimpLok modules are available with brake or drive mounting provisions. Lateral adjust with up to +/- 2” of adjustment, skew adjust with up to +/-.5” of adjustment, skew and lateral adjust and edge guide models are available. All SimpLok systems may be designed with CAC components, such as COR-LOK® air shafts and CAC air operated tension brakes for complete engineered solutions or they may be designed to incorporate other manufacturers’ components. CAC designs these systems to fit customers’ requirements. According to Jeff Damour, CAC Engineering Manager, SimpLok offers converters an extremely cost effective answer to increasing productivity and product quality. SimpLok unwind and rewind modules provide fast return on investment by improving roll handling and solving many web handling problems. Introducing Shaft-Lok® a new safely operated shaft holder system for unwind and rewind rolls. Unlike conventional safety chucks, Shaft-Lok® has no pinch points. According to Jeff Damour, CAC Engineering Manager, the pinch point free design offers a level of worker safety unequalled by any other shaft locking system. Shaft-Lok® opens only in the up position and allows a safe, easy unload operation. Shaft-Lok® is available in several models able to handle loads and weights up to 5,000 lbs. and operate flawlessly at low to high speeds. All models automatically lock to hold rotating shafts and feature all steel, extra heavy-duty construction, including heavy duty ball bearings. Shaft-Lok® features replaceable cradles and inserts which are available for square, diamond, triangle, 1/2 round and custom shaped shafts and shaft ends. The system is available in foot or flange mount designs. Skew and lateral adjustment assemblies are also available. "Our ability to custom engineer most of our products, including Shaft-Lok® allows us to offer the exceptionally safe and reliable system for virtually any unwind or rewind system. We can combine a standard Shaft-Lok® with CAC brakes for a total unwind solution, or offer custom designs to match any brake, clutch or drive a customer selects," Damour said. CAC offers rapid deliveries for standard units. According to Damour, Shaft-Lok® systems are competitively priced. Wind Gap, Pennsylvania: Converter Accessory Corporation (CAC), Wind Gap, Pennsylvania, is introducing an upgraded, more rugged, more durable. ShaftLock™ safe operation shaft holder for unwind and rewind rolls. The improved system does not compromise any of the features that made the first generation ShaftLock™ systems so successful. Unlike conventional safety chucks, ShaftLock™ is a safety chuck with no pinch points. According to Jeffrey Damour, CAC Engineering Manager, the pinch point free design offers a level of worker safety unequalled by any other shaft locking systems. ShaftLock™ opens only in the up position and allows a safe, easy unload operation. ShaftLock™ is available in several models able to handle loads and roll weights up to 5,000 lbs and operate flawlessly at low to high speeds. All models automatically lock to hold rotating shafts and feature all steel, extra heavy-duty construction, including heavy-duty ball bearings. ShaftLock™ features replaceable cradles and inserts which are available for square, diamond, triangle, 1/2 round and custom shaped shafts and shaft ends. The system is available in foot or flange mount designs. Skew and lateral adjustment assemblies are also available. ”ShaftLock has been very successful in the market. After a close look at performance we decided customers could benefit from a heavier duty model. Our ability to custom engineer most of our products, including ShaftLock, allows us to quickly respond to customers’ requests. ShaftLock is an exceptionally safe and reliable system for virtually any unwind or rewind system. We can combine a standard ShaftLock with CAC brakes for a total unwind solution, or offer custom designs to match any brake, clutch or drive a customer selects,“ Damour said. CAC offers rapid deliveries for standard units. According to Damour, Shaft Lock® systems are competitively priced. Converter Accessory Corporation (CAC), is introducing a new ”Bulldog” medium weight, low profile Shaft-Lok®, a safely operated shaft holder system for unwind and rewind rolls. Unlike conventional safety chucks, Shaft-Lok® has no pinch points. According to Jeffrey Damour, CAC Engineering Manager, the pinch point free design offers a level of worker safety unequalled by any other shaft locking systems. The new mid weight Bulldog Shaft-Lok® series is designed for loads to 3000 pounds and 1 1/2 inch shafts. It joins the light weight system for loads to 1000 pounds, 1 1/4 inch shafts and the heavy duty series for loads to 10,000 pounds and 2 inch shafts. In all sizes, the CAC Shaft-Lok® opens only in the up position and allows a safe, easy unload operation. All models automatically lock to hold rotating shafts and feature all steel, extra heavy-duty construction, including heavy-duty ball bearings. All Shaft-Loks® feature replaceable cradles and inserts which are available for square, diamond, triangle, 1/2 round and custom shaped shafts and shaft ends. The system is available in foot or flange mount designs. Skew and lateral adjustment assemblies are also available. ”The new Bulldog system gives customers so many off the shelf options that in practice the benefits match custom designs. The exceptionally safe and reliable Shaft-Lok® system is available for virtually any unwind or rewind system. We can also combine a standard Shaft-Lok® with CAC brakes for a total unwind solution, or offer custom designs to match any brake, clutch or drive a customer selects,“ Damour said. CAC offers rapid deliveries for Shaft-Lok® units at competitive prices. Converter Accessory Corporation is introducing new optional features available with its’ popular ShaftLok® safety chuck system. ShaftLok® safety chucks are now available with a newly designed, spring loaded, hand operated sliding mechanism which ensures the shaft capture plate cannot open without the machine operator physically operating the slider first. Another optional feature is a mounted proximity sensor that will detect whether the capture plate is open or closed. "Our customers requested these two additional features, so we decided to design them and offer them as optional features within our standard safety chuck system," Jeff Damour, Engineering Manager said. ShaftLok® safety chucks are an exceptionally rugged method of holding the journals of unwind and rewind shafts. They include shaft capture plates that open only in the up position. They feature replaceable shaft cradle inserts available in square, triangle, diamond and round shaft configurations. Models are available in standard duty, medium duty and heavy duty. Axially sliding shaft capture plates ensure pinch point free operation. Wind Gap, Pennsylvania: CAC's latest single station and multi station unwind and rewind systems are engineered as modular technology allowing them to be easily integrated into existing lines. Among the benefits offered by CAC unwinds and rewinds are that they allow processors to easily and economically add a station and increase production, expand capabilities and reduce changeovers by allowing larger rolls. According to Jeff Damour, CAC Engineering Manager, CAC unwinds and rewinds can be custom configured using off the shelf components and may be as simple or as sophisticated as the customer's application requires. They are exceptionally competitively priced competitive, are usually delivered and installed very quickly and are compatible with all web production materials. CAC offers an exceptionally broad range of sizes and capabilities, including manual and automatic controls. Rolls can be handled at up to 2000 fpm in diameters to 60 inches and web widths to 120 inches and weights to 3000 lbs. For wider web applications, stand alone systems are the preferred choice. Machine mounted systems are available for narrow web operations and are offered in a wide range of simple to sophisticated systems. ”The benefits of our unwinds and rewinds are extraordinary. With a simple installation we can allow a converter to develop an entirely new process, such as laminating, for example. The modular construction designs made possible by our decades of experience in virtually all types of web operations make these systems an unusually cost effective solution to a converter's desire to grow without investing in a major overhaul. It is precisely the kind of technology converters tell us they are looking for-effective, easy to install, easy to maintain,“ Damour said. CAC unwind and rewind options include single and multi-station in dual support pedestal and cantilevered configurations. CAC unwind and rewind stands feature compact designs to minimize floor space requirements and are heavy-duty; constructed of structural steel for maximum strength and rigidity. All systems are engineered to be readily retrofitted to existing lines and to seamlessly incorporate the full range of CAC web handling technology including air shafts, and safety chucks. A typical custom configured CAC unwind/rewind system may include a wide range of CAC supplied options, including closed or open loop automatic tension control, web guide systems, COR-LOK® air shaft featuring exceptional gripping power, Shaft-Lok safety chucks, and idler rolls featuring Winertia® engineered aluminum tubing. Currently celebrating its 31st year of success, Converter Accessory Corporation designs, engineers and manufactures web handling equipment for converters of paper, film, foil, nonwovens and textiles. Engineered solutions include high quality, cost effective equipment from the simplest aluminum core cone to the most sophisticated unwind/rewind system. CAC is represented by knowledgeable sales engineers and provides extensive consultation and post sales support. Converter Accessory Corporation (CAC®) is introducing a new dual station system (SW2) that allows on-the-fly cutover with minimal to zero stop time. The SW2 is engineered for web widths to 30 inches and capable of rewinding rolls up to 36 inches in diameter in weights to 600 pounds. A robust drive delivers speed ranging from fractional to 1000 feet per minute. The complete, belt driven system is supplied with a torque controlled motor with manual control, digital torque setting and emergency ”stop“function. The SW2 will readily accommodate automatic tension control if desired. According to Jeff Damour, CAC® Engineering Manager, the SW2 is ideal for rewinding edge trim and label matrix scrap and is much faster than single station systems. While aimed at scrap rewind, the SW2 may also used for any rewinding application that fits the SW2's capabilities. ”Like all CAC systems, the SW2 is engineered for easy operation, easy maintenance and easy installation. It can be installed on a machine frame, table top or floor mounted. The belt drive is designed for reliable, quiet operation,“ Damour said. The SW2 features CAC's widely used COR-LOK air shafts for fast, easy core locking and rapid roll changes. In addition to the SW2, CAC offers a wide range of unwind and rewind technology optimized by CAC's unique ”building block“ approach. This approach begins with two basic pedestals to which any or all of CAC's web handling accessories can be added; including core support systems, shaft support systems, pneumatic conveying systems and wrinkle removal systems. Drawing on the experience of more than 30 years of success, Converter Accessory Corporation designs, engineers and manufactures web handling equipment for converters of paper, film, foil, nonwovens and textiles. Engineered solutions include high quality, cost effective equipment from the simplest aluminum core cone to the most sophisticated unwind/rewind system. CAC is represented by knowledgeable sales engineers and provides extensive consultation and post sales support. CAC is now offering idler rolls featuring patented Winertia ™ engineered profile aluminum tubing specifically designed and engineered for idlers used in the converting industry. CAC idler rolls are available with standard outside diameters of 3”, 4”, 5”, 6” and 8”. Special diameters are also available. Face widths are available up to 140”. Standard roll finish is 30 Ra. Various roll coatings/coverings are available in rubber, Teflon, plasma, anodize, chrome, and nickel. Grooved roll face is also available in many standard and custom machined profiles. CAC idlers are supplied with low friction bearings, improving web handling by maximizing web traction with the idler roll face. They are available in both dead shaft (center shaft fixed) and live shaft (journals rotate with roll face) construction. Rolls are dynamically balanced to minimize vibration. Roll faces are machined to maximize concentricity. Optional mounting blocks and bearings are available for both types. Materials available for idler roll construction are steel, aluminum, stainless steel and Winertia™. According to Jeff Damour, CAC engineering manager, Winertia™ engineered profile aluminum tubing for idlers offers customers performance superior to that of any other idlers employing aluminum tubing. Benefits include lower weight, which translates to 10-30% less rotational inertia and momentum, improving web traction with the idler roll face, which improves web handling and behavior, Winertia™ also allows us to better position support bearings or supply dual bearing supports to minimize roll face deflection. Unique 3D balancing contributes to better roll performance. The result is faster, smoother operation that cannot be achieved with conventional aluminum tubing. CAC now designs and manufactures both standard and custom precision, air loaded nip roll modules. These air loaded nip modules allow precise side-to-side gap adjustment, independent of precise pneumatic pressure adjustment. They can be supplied as non driven or with complete drive systems. All feature plate steel framework and may be supplied with either dual side frames or cantilevered for narrow width applications. CAC nip roll modules have proven to be effective with all types of webs, including film, foil, paper, textiles and nonwovens. Typically they are used where independent tension zones are required. However, they are also utilized in laminating, coating and calendaring applications. Nip modules are designed to be easily placed in existing machinery or engineered as part of a new machine build. Nip rolls are available with many types of coatings including chrome, plasma, nickel and Teflon. Rubber coverings, including silicone, neoprene, EPDM, urethane and others are also available. Roll materials may be ordered in aluminum, steel or brass. Finishes can range from ground mirror finish to course knurls. Roll diameters from 1" to 18" and roll faces from 3" to 120" are available. CAC’s electrically heated roll, model EHR, may be incorporated in the nip roll module to facilitate web heating. They may also be combined with CAC’s rotational type dancer rolls to control web tension entering and / or exiting the nip module. Jeff Damour, Engineering Manager said, "We are delighted to offer our customers a broad array of nip module configurations with extensive roll coverings and configurations available. All our precision, air loaded nip roll modules are designed to be readily retrofitted to virtually any converting operation as single upgrade components or as part of an overall web handling package. We take pride in designing these modules for efficient, smooth installations." Founded in 1974, Converter Accessory Corporation designs, engineers and manufactures web handling equipment for converters of paper, film, foil, nonwovens and textiles. Engineered solutions include high quality, cost effective equipment for narrow web to wide web, slow speed to high speed, prototyping to full production applications. CAC is represented by knowledgeable engineering staff and provides extensive consultation and unparalleled product support. CAC’s newest Tension Air Brake (TAB) is engineered to be reliable, versatile and exceptionally easy to use. It is specifically designed to be easily employed with CAC’s widely used ShaftLok™ safety shaft holders for a complete unwind upgrade, but may also be integrated with less advanced, traditional shaft holders. The TAB offers a broad torque range, excellent heat dissipation and operates on plain air. It can be operated manually via a simple pressure regulator or readily combined with an automatic tension control system. TAB has three friction coefficients to choose from and is available in 2, 4, 6 or 8 friction pad engagement configurations for a proper, custom torque match to individual setups. Jeff Damour, CAC Engineering Manager, says the TAB is distinguished by an elegantly simple design that makes it especially easy to implement and operate. 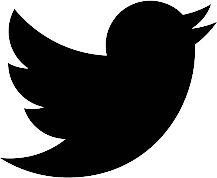 “We apply everything we’ve learned over three decades to every web enhancement product we offer. All components, even the most basic, are carefully engineered and meticulously fabricated to fit smoothly into our building block approach to web handling,” Damour said.